Sarah is a North West Coast local. 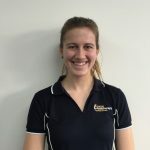 She completed a Bachelor of Health Sciences/Masters of Physiotherapy degree in 2015 at La Trobe University in Melbourne, before returning to the coastal lifestyle. Sarah also has previous experience as an adult swim teacher and lifeguard. She is interested in a range of leisure actives including surfing, netball, surf lifesaving, swimming, bushwalking and running.